The Great King Cake Debate: Who Makes the Best King Cake? Ah, King Cakes – the sweet treat that announces the start of Carnival season on January 6th — known as “Epiphany,” “Twelfth Night,” or “Kings Day.” Originating centuries ago, the tradition has evolved over time, but modern-day King Cakes still feature the purple, green, and gold colors that symbolize justice, faith, and power, and a plastic baby, in place of the original bean. Today there are dozens of variations on that theme, with choices of pastry, filling, and toppings to please every taste. Who makes the best King Cakes? It depends! 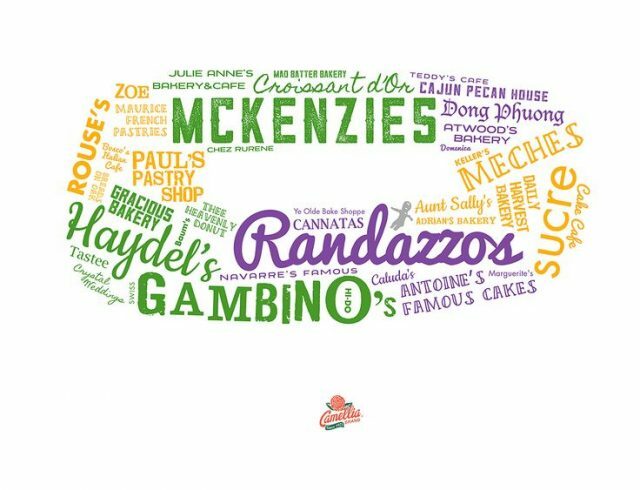 Some swear by beloved traditional options that bring back childhood memories at the first taste – McKenzies, Haydels, Gambino’s, and Randazzo’s, to name just a few, while others opt for a more creative take on the confection. Places like Sucre, Gracious Bakery, Croissant D’or, Dong Phuong Bakery, and The Cake Cafe offer more specialized versions, and have legions of loyal fans as well. Whatever the style, King Cakes unite us — in offices and homes across the region — as a tasty token of a season of celebration – Mardi Gras! Tell us – when the baby turns up in your slice, where are you going to get that next King Cake?